NTDC Assistant Draftsman Tracer Jobs Via NTS has been announce. 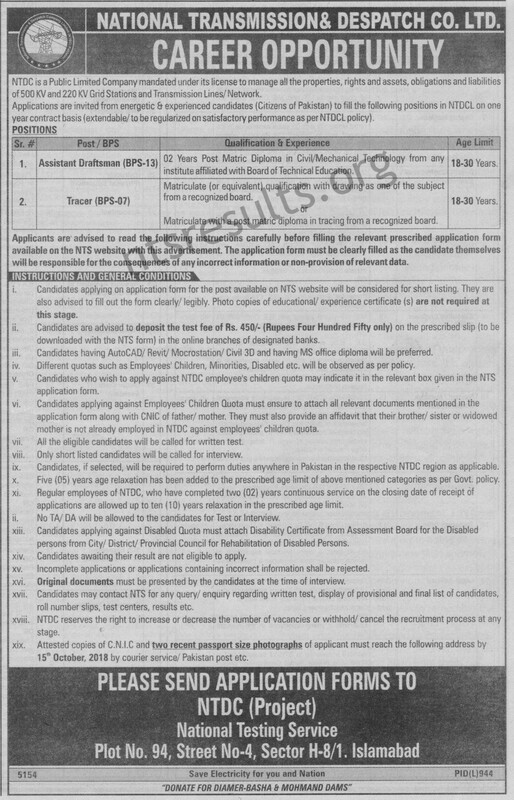 Last date to apply for National Transmission & Despatch Company is Monday, 15th October 2018. NTDC wapda is a Pakistani government-owned power transmission company. Transmission and Dispatch Company of Pakistan operates fourteen 500 KV as well as thirty-eight 220 KV grid stations. Moreover, NTDC Transmission Dispatch Company also controls 5110.48 km of 500 KV transmission line and 9686.32 km of 220 KV transmission line in all over Pakistan. National Transmission Dispatch Company are inviting applications from energetic as well as experienced candidates to fill the positions in NTDC. These position are offer on contract basis for the period of 1 one year. All Citizens of Pakistan are eligible to apply. Applying criteria and other details for the jobs in NTDC are describe below. Candidates are advise to pay Rupees 450. Test fee can be pay in any branch of MCB, ABL, HBL or Mezan bank. Candidates having AUTO CAT/ Revit / Micro station / Civil 3D / and having MS office diploma will be preferred. All the eligible candidates will be call for written test. Only short list candidates will be call for test/ interview. Last date to apply online is Monday, 15th October, 2018.